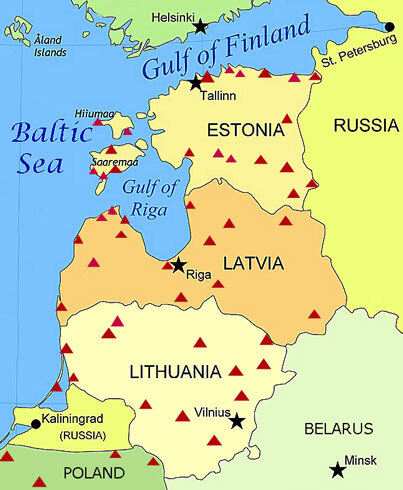 The interactive map (right) gives the outline location of all campsites used by us in Lithuania, Latvia and Estonia during our summer 2011 trip; to find the campsite's exact location, copy/paste the GPS co-ordinates into Google/Bing Maps. It is important to stress that comments given relate purely to the dates of our stay which in many cases was peak holiday season. Other sources of campsite information and listings are given on the Travel Tips Page. Stellplatz Whit weekend NOT the time to visit Usedom!! Dünencamp is a vast beach-side holiday resort over-crammed with caravans. 50 kits Friendly and hospitable welcome from the Jocai family, the very epitome of kindness; a small family-run campsite set in gardens behind the guesthouse in suburbs of Šiauliai; 2 camping areas, one under heavy shade of trees, other in large open grassy area overlooking family's smallholding and vegetable gardens; facilities clean and modern; washing machine at 5 lits, free wi-fi but limited area around house; mother brings fruit and vegetables from their garden; superb value with homely hospitality.